Smartwatches are extremely popular nowadays because of all the practical features they make accessible right on your wrist. They allow you to quickly interact with your phone, they push notifications so you never miss out on anything, and some of them can even help track your health. The LG G Watch was one of the first smartwatches to arrive in the market and it conveniently runs on Google’s own smartwatch software, Android Wear. Therefore, if you are already an Android user, you might not need a lot of time to get used to it. We took the LG G Watch for a spin and here’s what we found out. Since the LG G Watch was the brand’s first attempt in providing a decent smartwatch, it seemed like it was a just a prelude to something grander. It wasn’t packed with features upon release and there will definitely be newer smartwatches that will easily defeat it. 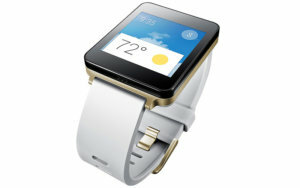 It appeared like any ordinary smartwatch – boxy with rubber straps. In most cases, this smartwatch felt ordinary, boring, and dull. Still, it arrived with a pretty solid build, which is something we expected from a top tech brand. This LG G has a 1.65-inch IPS display. Apparently, LG chose to put an IPS display on the watch to help save battery life. Unfortunately, since it has an IPS display, it lacks the vibrance and color that an AMOLED display offers. Using it during daytime proved difficult because we weren’t able to see anything on its display when we tried to view it under the sunlight or even in a brightly lit room. LG G is powered by a swift 1.2GHz Qualcomm Snapdragon 400 processor. Therefore, we had no issues switching from app to app and the overall experience was smooth. The watch has a 512MB of RAM and 4GB of internal memory, which we found sufficient. Unlike a smartphone, we didn’t need a lot of internal memory on this device anyway. The LG G Watch easily fits on the wrist and has dimensions of 37.9 x 46.5 x 9.95mm. Essentially, Android Wear is a ported version of the Android OS and is placed on your wrist. It offers several useful features like push notifications from your phone to your watch, it offers voice command capability, and provides a user interface that allows swiping and tapping of pop-up cards. Additionally, it lets compatible phone apps load a more compact version into the watch with added useful features. Android Wear works with voice commands and it caters to the limited capability of a smartwatch. Unlike other Android devices, smartwatches don’t have a camera or a speaker, and Android Wear works without needing either of these. This software also offers a certain level of uniformity. Therefore, different watches that run on Android Wear have the same look and feel but they are not absolutely identical. For instance, an LG G Watch may have different options for its watch face compared to the Android watches from other brands. Android Wear allows the LG G to easily sync with an Android smartphone through an app and a Bluetooth connection. Since it connects via Bluetooth, it can only sync with one device at a time. It is compatible with almost any Android smartphone running on Android 4.3 or higher. We were able to seamlessly connect it to our LG smartphone and never noticed any lags or intermittent disconnections from the phone. Through that connection, we were able to access our phone using the watch. We could search on Google Play for apps compatible with the watch, change its watch face, adjust different settings, and select what apps we wanted to receive notifications from. By default, any app that shows notifications on the phone is pushed into the watch as cards, a feature that can feel spammy at times. With the capability to turn these notifications off, we were able to customize what notifications are important and which notifications to ignore and check later on the phone. The cards pushed into the phone can be swiped away, tapped to read more about it, or swiped to reply. Still, we needed the phone most of the time to complete certain tasks. There is an “open on phone” feature that wakes up the phone to continue a task but sometimes this felt that the smartwatch was lacking even more. Although not all apps know yet how to fully utilize the smartwatch layout, there are some nice apps out there that work well including the navigation view on Google Maps and the compressed notifications from Facebook and Twitter. As a device placed on your wrist, you might expect that the LG G Watch has a plethora of health and fitness features. It was rather unfortunate to learn that the only health and fitness feature on this watch is its pedometer. At the very least, this watch can help track the number of steps you take. Unfortunately, Android Wear doesn’t include a lot of health and fitness apps right now but we might soon see more. When we wore this watch, the number of steps we took just popped up randomly among the set of other cards on its interface. Google already has its own fitness app, Google Fit, but it doesn’t work very well on this particular smartwatch. There might be other watches available that offer full use of Google Fit, offering several fitness apps and accessories. The LG G Watch has a 400mAh battery and despite having an IPS display that was expected to improve its battery life, its actual battery life leaves much to be desired. The smartwatch lasts only a day on a single full charge with regular use, which means that all the basic smartwatch functions are running and the display is set to always-on. To save its battery life, we tried setting the display to turn dim after a few seconds then it would just light up again when we tapped on it or when we moved our arm to look at the display. This helped lengthen its battery life a bit but it felt like it defeated the idea of having an always-on watch. Also, the minimal additional battery life didn’t feel worth the hassle. To make sure that it had enough juice to run the next day, the watch had to be recharged every night. It’s good to know that this watch has a flat magnetic charging cradle that made recharging easy. Even if the watch charge pretty fast, it was disappointing that its short battery life prevented using the watch overnight. Like most firsts, the LG G Watch isn’t the best smartwatch out there but it holds a promising future to what the smartwatch market may become someday for this brand. This ordinary-looking watch may not be jam-packed with features but it gets the basic job done. It gives the time, it pushes notifications, and it provides quick access to a compatible smartphone. Also, it works seamlessly with Android Wear, which is really great. However, this makes it look like a watch that a software or app developer would want to work on rather than a watch that you would confidently show to your friends. Still, even if the LG G Watch isn’t perfect, it carries a lot of potential. When it evolves and matures, it is likely to provide a more high-end overall experience. Take note, the beautiful smartphones we have around also started as bricks that can simply make a call and receive a text message, but look how far they’ve come to be these very useful devices that we can’t live without. Previous Post« Previous Hasselblad X1D-50c Medium Format Mirrorless: Is it Worth the Price?